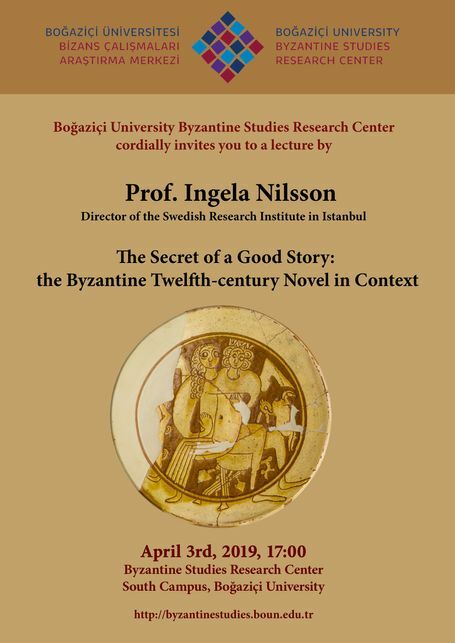 İstanbul İsveç Araştırmaları Enstitüsü Direktörü Prof. Ingela Nilsson tarafından verilecek "The Secret of a Good Story: The Byzantine Twelfth-Century Novel in Context" başlıklı konuşma 3 Nisan 2019 günü saat 17.00'da Boğaziçi Üniversitesi Bizans Araştırmaları Merkezinde gerçekleşmiştir. Ancient and Byzantine novels were for a long time neglected or even despised by scholars for being silly love stories of little concern to the overall history of pre-modern literature written in Greek. The past couple of decades have seen a decisive shift in attitude and the novels are now seen as a relevant part of both the ancient and the Byzantine heritage, with significant connections to both Eastern and European novelistic traditions. The twelfth-century novels in particular have been subject to an increasing interest: reappraised as rhetorical set pieces written by authors close to the Komnenian court, they are now accepted as central works of an experimental and sophisticated literary culture. This lecture offers an introduction to the genre in light of this scholarly development.